49-51 Helen Street, Govan, Glasgow. The Beacon sat at the corner of Helen Street and Roberts Street. In 1899 Jessie Duncan Miller held the licence for these premises. From 1912 to the 1950 the licence was held by Joseph Robb. Mr Robb also held other licence's in the city as a trustee for Hugh Patrick, 362 Main Street, Bridgeton and 15 Mair Street, Govan. Mr Robb was a member of the Glasgow Kareless Klub. also see other Kareless Klub members. click here. 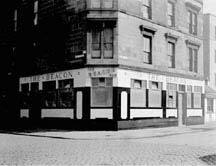 In 1960 the pubs was run by John Young Robertson before Matthew Miller took over in 1963, trading as Hugh Patrick's Trust Ltd. The Beacon survived until the late 1970s.